The new scientific decade 2013–2022 of IAHS, entitled “Panta Rhei – Everything Flows”, is dedicated to research activities on change in hydrology and society. The purpose of Panta Rhei is to reach an improved interpretation of the processes governing the water cycle by focusing on their changing dynamics in connection with rapidly changing human systems. Panta Rhei is presented by Montanari et al., Panta Rhei—Everything Flows”:Change in hydrology and society—The IAHS Scientific Decade 2013–2022, Hydrological Sciences Journal, 58:6, 1256-1275, DOI:10.1080/02626667.2013.809088. The practical aim is to improve our capability to make predictions of water resources dynamics to support sustainable societal development in a changing environment. The concept implies a focus on hydrological systems as a changing interface between environment and society, whose dynamics are essential to determine water security, human safety and development, and to set priorities for environmental management. The Scientific Decade 2013–2022 will devise innovative theoretical blueprints for the representation of processes including change and will focus on advanced monitoring and data analysis techniques. Interdisciplinarity will be sought by increased efforts to bridge with the socio–economic sciences and geosciences in general. The main concepts for the scientific activity being developed in Panta Rhei can be summarised in the following statements. 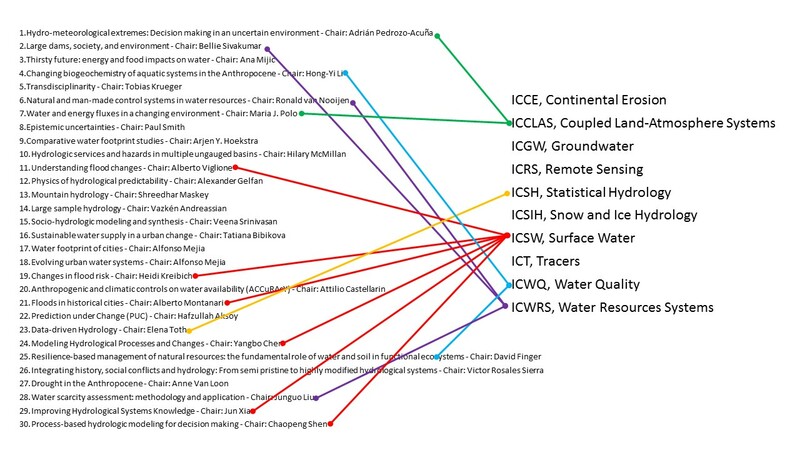 The interaction between hydrology and society is changing, therefore implying new connections and in particular more significant feedbacks which need to be understood, assessed, modelled and predicted by adopting an interdisciplinary approach. Humans are an important part of the system: there is the need to study the two–way coupling between humans and nature (socio–hydrology) within a more comprehensive framework. Co–evolution of hydrological and connected systems (including society) needs to be recognised and modelled with a suitable approach, in order to predict their reaction to change. The feedbacks between hydrological processes, catchment structure, society and ecosystems provide important information on catchment functioning (Figure 1 and Figure 6). Hydrological processes determine the relationship between environment and humans (by determining, among others, water related risks and water security). Hydrological change is vital to society as well as the environment itself. Change is resulting from the superimposition of natural variability and human induced effects. Their interaction is critical for deciphering the feedbacks on the environment and hydrological systems. Advances in hydrology are currently limited by the available measurement techniques. The community should therefore be proactive in devising innovative monitoring strategies by taking advantage of new technologies and new generations of data. Future science must necessarily be based upon an interdisciplinary approach. There is a final and very important premise, identified by the community, for the success of Panta Rhei that is more philosophical than scientific. The research challenges for hydrology in the next 10 years should be tackled through a collective effort, therefore emphasising the key role that scientific associations like IAHS must play. Cooperation among researchers through science initiatives, exchange programmes and virtual laboratories is fundamental for the ongoing success of hydrological science as well as education and growth of the community. Hydrology must be dealt with by using collective and inclusive discussion and cooperation, while preserving the value of individual ideas and contributions. There are many countries in the world whose hydrological features are poorly known and the SD can contribute to fill this knowledge gap (Viglione et al., IAHS Blog) and to strengthen scientific expertise in areas that have an immense potential in terms of research contribution and community building. Target 2 – Estimation and prediction. Target3 – Science in practice. Panta Rhei recognizes the feedbacks between each of the three targets: improved understanding may potentially lead to more accurate predictions, which helps sustainable management. Figure 7 summarises the interactions among the targets of Panta Rhei. The science questions of Panta Rhei are both rooted in the fundamental concepts of hydrology and focused on society and environmental management. They propose a compelling synthesis between basic and applied research. Panta Rhei focuses on science for society.